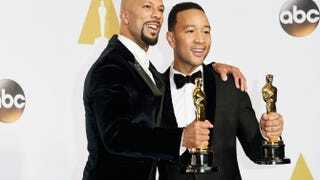 Common and John Legend pose for pictures after winning the Oscar for Best Original Song for “Glory” from the movie Selma Feb. 22, 2015, in Hollywood, Calif.
John Legend and Common took home an Oscar last night for best original song for “Glory” from Ava DuVernay’s film Selma. It was the only award the movie won last night, though the film was also nominated for best picture. Legend, who is also an activist when it comes to social justice and education, gave a memorable speech in which he compared the number of 19th-century slaves with the number of Americans currently incarcerated in the United States. Common also chimed in, stating that it’s important to use the Oscars as a platform to highlight present-day social issues. “To whom much is given, much is required,” he said. In reference to Legend’s slavery comparison, there are those who previously disputed the comparison. In 2011 Alfred A. Edmond Jr., Black Enterprise’s senior vice president/multimedia editor at large, stated that the comparison should be looked at in context, and he used data from the 1850 and 2010 censuses to refute the comparison. “While the fact that today’s black incarcerated population is larger than the 1850 slavery population in sheer numbers (and alarmingly out of proportion to black Americans’ share of the U.S. population) is a shocking comparison, it doesn’t really say much,” Edmond wrote for Black Enterprise. “That’s because today’s total black population is far larger than America’s black population in 1850. So a more accurate and illustrative comparison would be the percentage of the black population who were slaves in 1850 versus the percentage of the black population incarcerated today. Even when looked at in that context, there is still the undeniable fact that the systematic mass incarceration of African Americans is something that needs to be addressed and remedied—which was what Legend was trying to make clear in his acceptance speech.